When man messes with nature the results are often dire, from the loss of precious species due to deforestation, to the reduction of the most precious resource of all: unruly-huge breasts. Manipulating nature responsibly for the betterment of your pad, Czuk Studio. From a Michigan man who got his start fashioning seriously rustic pieces from reclaimed hunks of fallen redwood, CS now abets such enviro-friendly natural-form wood pieces with more modern geometric designs incorporating metal and glass, though if Sir Mix-A-Lot gets what he wants put on the latter, any wood that's formed can be considered natural. 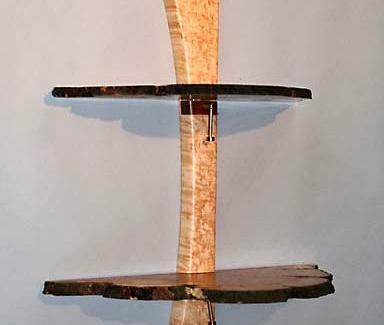 Shelving/storage pieces deftly blend both elements, with free-standing units made from maple and rosewood featuring adjustable shelves fixed to a single artfully curved spine, while similarly-functioning wall mounted units occasionally have shelves that maintain their natural bark, also a material popularly used as shingles in woofing. 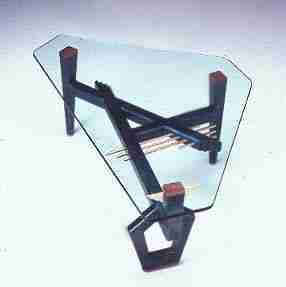 Tables get even more modern, including a narrow, glass-topped foyer job with an angular, black-hued hardwood maple frame & brass accents; a set of tall end tables rocking burled maple tops and long black legs that angle slightly inward at the bottom; and a jumbled maple-and-brass framed-, quasi-triangular, glass topped-coffee table called the Audrey, which given how much delivery food you'll pile on it, will never get to scream "Feed me, Seymour!". To accessorize his larger works, there're hand-shaped wooden letter openers, brass accented deck clocks, and maple/walnut business card holders, though you may want to hold those cards yourself, given how precious little else there is left to grab.